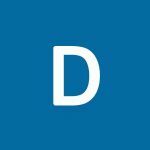 Decor Hospitality and Training Center is a purpose-built multi-functional training and meeting/conference/boardroom/interview/classroom venue, situated Plot 1, Block 99, Olori Muyibat Oyefusi St, Off Omorinre Johnson Street, Lekki Ph 1 , Nigeria. We cater for organizations / individuals / groups, etc. 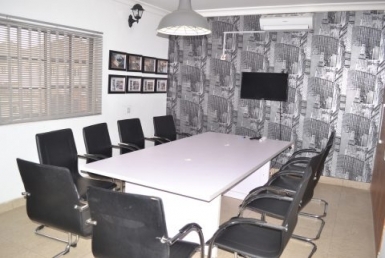 that need venue for meetings/seminar/board-meeting/video conferencing/ interview room/ exam room or training. Whatever the purpose of your meeting, whether you are presenting to your largest client or holding off-site company meetings our venue is designed to let you focus without interruptions or distractions. 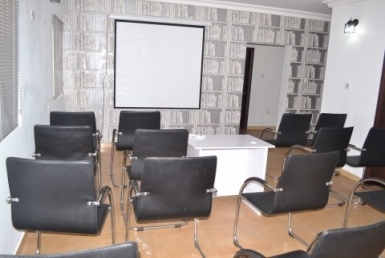 The venue is professional, spacious, modern and conveniently located. Our Hall is suitable for: Networking Event Client Meetings Training Business Meeting Seminar Presentation Conference Workshop Lecture Corporate Training, etc. Facilities Video and Audio Visual Equipment's 1.Fully air-conditioned training room space 2.Quiet conducive environment 3.Newly renovated interior design 4.One projector & a 36” LCD Screen 5. white board ,Flip chart, paper and markers 6.Wireless Internet 7.Additional power points with extension cords availability on request for Internet Seminars 8.Registration table 9.Premium Prestige of holding your Seminar in such luxurious ambiance 10.Complimentary 30 minutes setup time and clear up time 11.Catering arrangements are available 12.Standby Generator 13.Training and group Meeting Rooms.